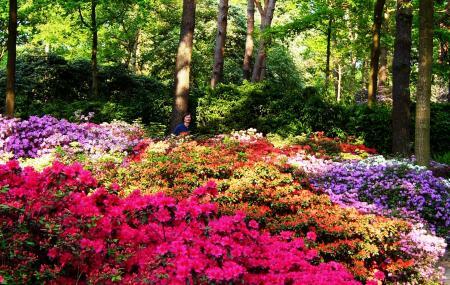 Find hotel near Rhododendronpark Bremen A ..
One of Bremens’ loveliest attractions, this collection of Rhododendrons and azaleas is one of the largest in the world. Shady trails course through vividly colourful bushes. Over 550 species of the flowers grow here. The best time to visit the park is in May, when park’s late spring display simply dazzles you with brilliant whites, red, yellows and violets. Hundreds of thousands of people come to see them. You’ll also find a Bonsai Garden, a Rose Garden and a Scent Garden. The park’s other attraction is Botanika, a 3 acre ‘green science centre that showcases’ natural garden exhibits from diverse Asian landscapes – the Himalaya, the Far East, and Borneo. It also has a Japanese Garden, a medical garden, and a heath garden. How popular is Rhododendronpark Bremen And Botanika? People normally club together Burgerpark And City Forest and Breminale while planning their visit to Rhododendronpark Bremen And Botanika.